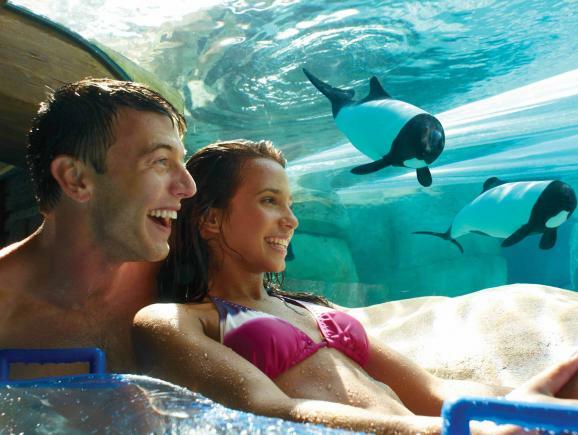 Aquatica is a whimsical, one-of-a-kind waterpark that is unique to Orlando and could only be created by the team behind SeaWorld. Here you'll find not one, but two river rides. One river floats you through an undersea world of colourful fish and another races you into rolling rapids. 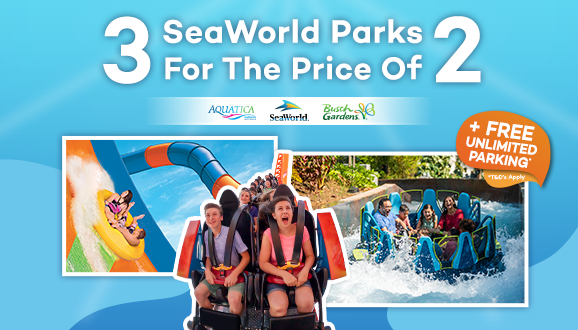 Slides spin and soak you, while the incredible signature ride Dolphin Plunge® sends you speeding through a lively lagoon filled with playful beautiful Commerson’s dolphins! Delight in the serene-to-extreme waters in the gigantic double wave pools and soak in the sun (or the cooling shade) on the white sand beach. 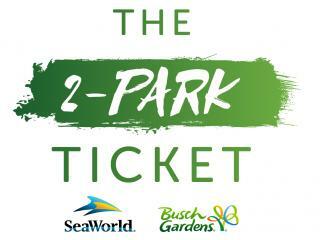 Do you dare ride the tallest, most thrilling water ride of its type to hit Orlando? Prepare for an adrenaline rushing one-of-a-kind experience like no other as you take on Ihu’s Breakaway Falls™. Standing at nearly 80-feet tall and with a vertical drop measuring 40-feet long, Ihu’s Breakaway Falls™ is world’s longest drop tower multi-slide ride of its kind. 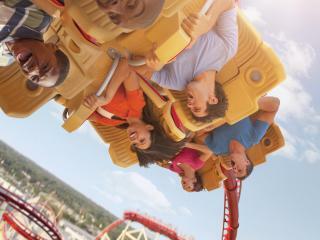 Riders will step into one of three clear ‘breakaway boxes’ at the top of the ride where they face each other – not knowing who will drop first – before the floor disappears and they plunge down at a rate of 20 – 24 feet per second. 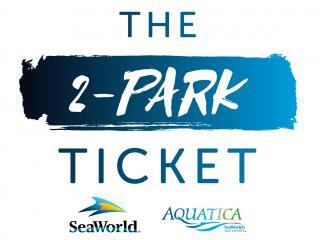 To ensure guests have a great experience at Aquatica Orlando, the park has a strict daily capacity of 6,500. 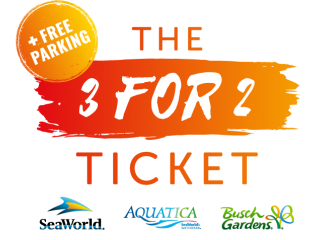 Guests with pre-purchased multi-day Aquatica tickets do get priority over people wanting to buy tickets at the gate so it's well worth buying Aquatica tickets in the UK before you go. 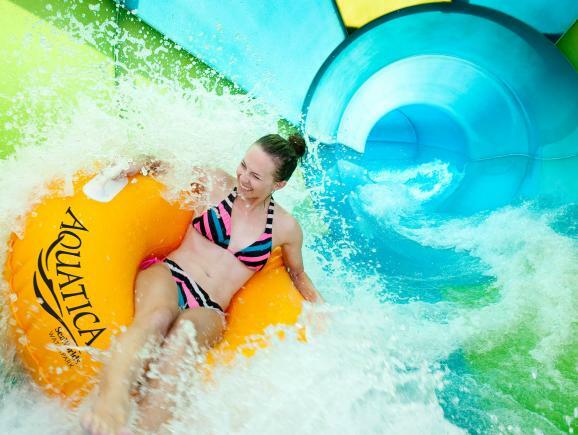 Aquatica water park in Orlando is where the fun is as endless as the sea itself. Prepare for an adrenaline rushing one-of-a-kind experience like no other as you ride the world’s longest drop tower multi-slide ride. Ihu’s Breakaway Falls™ features four different slides each boasting the steepest and tallest 360-degree spirals in the southern United States. Riders will step into one of three clear ‘breakaway boxes’ at the top of the ride where they face each other – not knowing who will drop first! 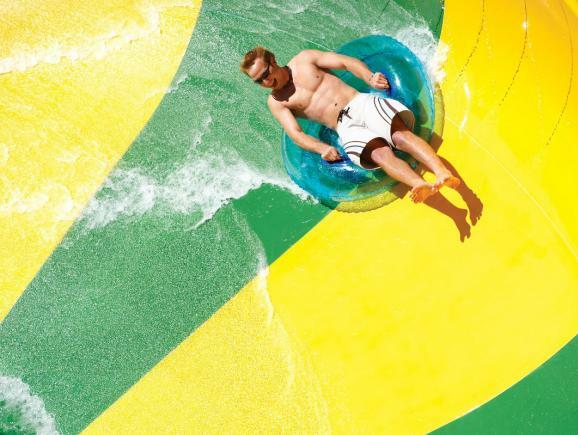 Catch a wave in the world’s only side-by-side wave pools which operate together or independently. Cutback Cove creates gently rolling surf while Big Surf Shores produces crashing waves with five-foot swells. Minimum Height - Guests under 51" (1.30m) are required to wear a life vest. This adventure river zips you through 1,500 feet of rapids, past geysers and through waterfalls at a speed three to four times faster than a typical waterpark river. Minimum Height - Guests under 48" (1.22m) are required to wear life vest. 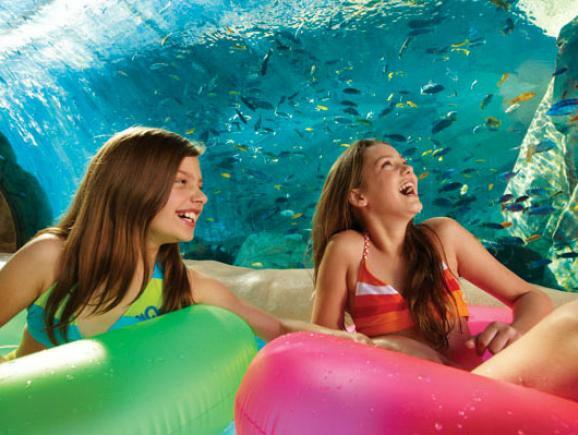 For a slower pace, this lazy river floats you through a spectacular underwater view of the Commerson’s dolphins, past exotic birds and a beautiful habitat of thousands of exotic fish. Minimum Height - 42" (1.07m) and wear a life vest. For those who prefer life in the fast lane, Taumata Racerspeeds riders down a 300-foot slide, in and out of tunnels and around a 360-degree turn before racing them across the finish line. Minimum Height - 42" (1.07m). 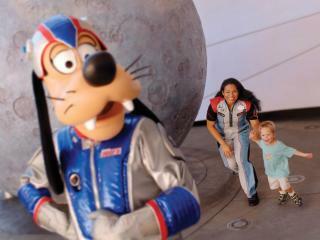 Guests under 48" (1.22m) are required to wear life vest. 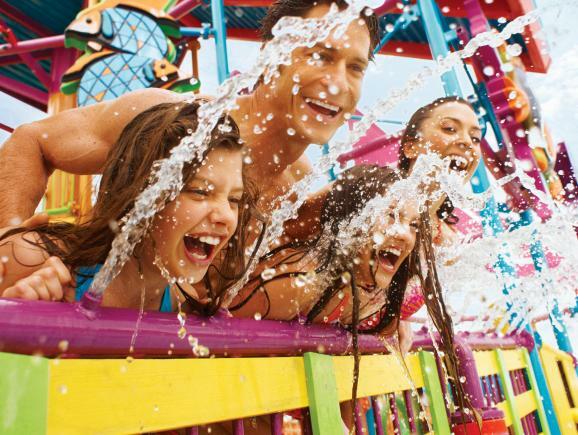 Soar down this six-storey, 250-foot, triple-drop water ride. 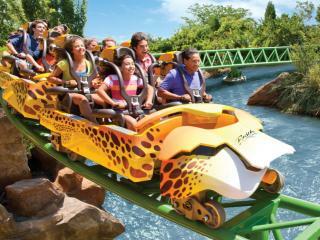 The seven-foot-wide flume takes four riders at a time on a straight shot down - three times! 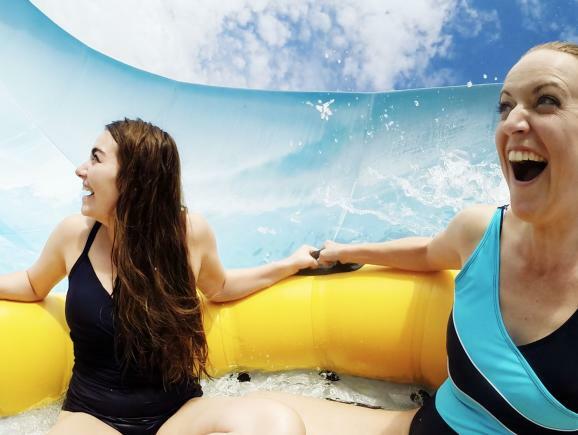 This family raft ride splashes four guests at a time down six storeys and through an array of tunnels, twists and turns. 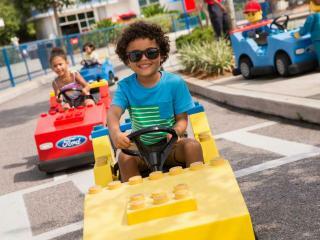 High-speed tubes and half pipe funnels will have you splashing and sliding frontward and backward and climbing the walls! 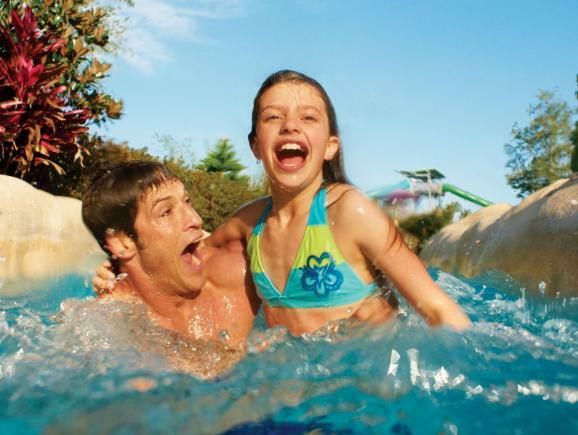 This irresistible water wonderland for children contains features an array of fountains, rides and slides. Tiny tots - even those too young to walk - can enjoy sliding with mum and dad in specially designed rafts. Went later in the day when the park was quieter as we had 6 small children with us so lots of people had left, the bigger ones got on all the rides straight away or with short wait. Loved this park.